So for weeks Varen has been planning this surprise secret weekend away, and finally the day arrived. We set off early, leaving work at 1pm for our 4 hour journey. I had no idea where we were headed, and that was fantastic! We drove up thru Magaliesburg ... which momentarily scared me after my experience there with Mom, but I soon realised that Magalies was not near far enough away to warrant a 4 hour drive. We drove and drove. Thru Koster and up towards Zeerust - I had no idea where the hell these places were, but there were plenty of signs to Gaborone ... he didn't tell me I might need my passport! I didn't, we stopped about 30kms from Gaborone at the Buffalo Ridge Safari Lodge in the Madikwe Game Reserve. We arrived fairly late, at about 7pm - we'd had some lunch along the way. But it was beautiful. There were oil lamps lighting the road to reception and we were greeted with a sherry on arrival. After a few minutes to settle in and look around, they came to fetch us for dinner - you can't walk around on your own at night. Then it was back to the room to try out the shower after our long drive and to get some much needed sleep, we had an early morning wake up call for the game drive. This is the morning view from our chalet -> Enchanting. We were up early, at 6am for the game drive and in the 3 hours bouncing around on the back of the land rover, we managed to see lots of game: Lions, Ellies, Zebra, Giraffe, Wildebeest and a vast amount of buck. After the game drive which finished at about 9:30am, we enjoyed breakfast and went back to our room for some reading, relaxing and a snooze. Lunch was at 1:30 and after that we lazed in the sun on the pool deck (the pic Varen posted on Friday). Although the evenings and early mornings are quite chilly, the days in the bright sunshine are wonderful and warm. Then at 4pm we met again for our evening game drive. 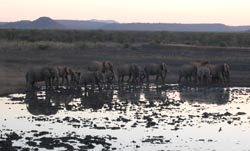 This was fabulous because we ended up at a huge watering hole with a huge herd of Elephants who were trying to get to the water. They were very skittish because there were 2 male lions, millions of Vultures and a few Jackal enjoying the remains of a Rhino carcass that had been killed by an Elephant on the Monday. It was very entertaining to watch the Ellies become more assertive, especially because they had quite a few young calves with them. They did eventually chase off the one Lion and I have a fantastic video clip of it :) Highlight! Then were enjoyed a few sundowners and made our way back to the Lodge in the dark. We even managed to glimpse 2 Rhino with the spot light. Thne it was dinner time ... one of the best meals ever. It was Ostrich fillet with a mango mint coulis, butternut and peppadew risotto. Delish! The next morning we decided to laze in bed and skip the early game drive ... it was weekend after all and really, how much better could the sightings get? 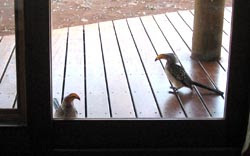 At about 7am tho, we got woken by a determined tapping on the glass doors. We had a very determined visitor, two Yellow Hornbills were obviously protecting their territory from their reflection. It was such fun to watch! We had a very lazy morning reading while waiting for the game drive to get back and breakfast to be served. I had the best omlette ever for breakfast, and I am not usually an omlette fan - I like my omelettes like I like my pizza. Light on the base / egg, heavy on the topping / filling! Then we lazed a bit more ... had to soak up the fabulous setting as much as possible before heading back to Jhb. We left at about 12:30 and made good time back to Joburg. We ended the weekend with a few episodes of Heroes and sushi at Sakura. This morning has been tricky so far, he's dealing with the fallout of such a fabulous weekend and the lack of real relationship, but hopefully we'll survive it because really, we do have a blast together when we're not arguing about the state of things and who's right and wrong! And now I have to try to get back to work and I have that funny dread feeling in the pit of my stomach about this week, no particular reason, it's just a feeling ... hopefully nothing.